Federal Communications Commission Chairman Julius Genachowski proposed a strategy for revamping that government subsidy program to help deploy high-speed Internet service to millions of Americans living in rural and costly-to-serve areas. Interesting stuff when you compare it to what the AT&T ad campaigns say about the benefits of the deal for rural America. "Data in the letter undermines AT&T's primary justification for the massive deal, while highlighting how AT&T is willing to pay a huge premium simply to reduce competition and keep T-Mobile out of Sprint's hands." "AT&T, who has fewer customers and more spectrum than Verizon (or any other company for that matter), has all the resources and spectrum they need for uniform LTE coverage without this deal." "The Institute of Electrical and Electronics Engineers (IEEE), the organisation that helped ignite the Wi-Fi revolution nearly a decade ago, has published a new wireless standard that promises to bring broadband access to under-served rural areas. Called IEEE 802.22, the new specification has been designed to take advantage of those portions of the radio frequency spectrum that are increasingly available as digital television switchover schemes make progress around the world. With support for both VHF (very-high frequency) and UHF (ultra-high frequency) TV bands, sites as far as 100 kilometres away from a single transmitter could enjoy broadband speeds typical of more densely populated areas. According to the IEEE, each transmitter will be capable of delivering up to 22 Mbit/s per channel “without interfering with reception of existing TV broadcast stations, using the so-called white spaces between the occupied TV channels”." "Job opportunities will elude millions of mostly rural Americans because they lack access to high-speed Internet, according to a new report by the Federal Communications Commission (FCC). In Tennessee, more than 489,000 residents lack that access." Does your rural community have questions about satellite Internet service? Wondering if satellite connections can fill in for cable, DSL, or fiber? What are the limits of satellite Internet service and how much does it cost? Is satellite the same as broadband? 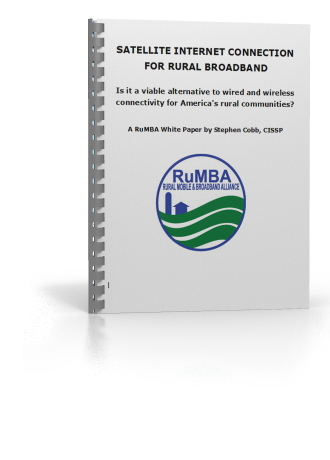 Just a quick reminder that you can find answers to these questions and more in a free 20-page report from the Rural Mobile and Broadband Alliance or RuMBA, written by veteran information technology expert Stephen Cobb, CISSP. You can get the report from this page. "More than 28 percent of the rural population in the U.S. lack access to midrange 3Mbps broadband service, according to a new report from two U.S. agencies." The gaps appear to be closing, but many rural residents "still lack access to the kind of broadband that most Americans take for granted," FCC Chairman Julius Genachowski said in a statement. "That is not acceptable..."
"The ambitious project will provide this rural region with a broadband infrastructure capable of delivering service speeds of up to 1 Gbps. It will deliver voice, data and IPTV services to 21,000 homes and 99 community anchor institutions across a nine-county service area." Another example of people finding an alternative to traditional big telco. "'We do not encourage our people to leave home in order to have what their city-dwelling counterparts have. We fear that this migration to technologically-progressive neighborhoods will decimate our rural landscape,' said Pat McKeown, executive director of the St. Lawrence County Chamber of Commerce." Gridline Communications - Consumer Broadband: "Gridline Communications, a Broadband communications company, has one simple goal. To utilize our broadband transport networks, deployed for Smart Grid services, to provide communities and their businesses and residents with reliable, cost effective, broadband access to communications, online services, and information." Electricity lines used in new broadband pilot: "US firm Gridline Communications has joined forces with Electricity Northwest, which controls the grid in the Shap area, to bring broadband to the 1,000 or so residents in the village." "America may have invented the Internet, but more than 100 million American lack access to broadband and its accompanying economic benefits, according to a new report from the Federal Communications Commission. Some 26 million Americans in largely rural areas across the nation lack high-speed connections to the Internet, the FCCs Broadband Progress Report to Congress found, cutting them off from broadband-based jobs and other economic opportunities." Millions of Americans Lack Access to Broadband's Economic Benefits: As reported in AOL Wallet Pop. "Independent Vermont Senator Bernie Sanders wants the FCC to disallow satellite service from qualifying as effective competition to cable service in his home state." You can download the whitepaper here. "Given the limitations of satellite Internet service detailed in this report, RuMBA cannot consider satellite a viable solution for rural communities who are increasingly cut off from mainstream America by the lack of access to affordable broadband service," said Luisa Handem, founder and Managing Director of RuMBA USA. With over 610,000 subscribers, HughesNet is the largest supplier of satellite Internet service in America. The billion dollar company that owns HughesNet is Hughes Network Systems, LLC, which routinely describes itself as "the world's leading provider of broadband satellite services." You can see this on the company website and in the company's reporting of its first quarter 2011 results. The problem is that broadband satellite is an oxymoron. The Internet you get from a satellite is not broadband. Just ask anybody who has used both satellite and cable, DSL, or fiber. The broadband functionality that DSL/cable/fiber users take for granted just doesn't work, or doesn't work well, over satellite; we're talking core functionality like automatic software updates, VoIP, VPN, NetFlix movies, website hosting, online backup and shared cloud storage services like Dropbox. Who says such functionality is not there? The satellite Internet companies themselves, including Hughes. This fact is made clear in a 22-page report just released by the Rural Mobile and Broadband Alliance. Conveniently known as RuMBA USA, this non-profit group seeks to expand the availability of affordable broadband access in rural America. Interesting observation: "The Center for Rural Strategies report concludes that having access to broadband is 'simply treading water or keeping up. Not having it means sinking.' Studies rank the United States overall between 25th and 29th in the world in terms of Internet speed. The report, 'Scholars' Roundtable: The Effects of Expanding Broadband to Rural Areas,' is can be downloaded here www.ruralstrategies.org." "The Center for Rural Strategies manages the partnerships and activities of the National Rural Assembly, a coalition made up of over 400 organizations and individuals from 47 states working at local, regional, and national levels to build more opportunity and better policy for rural communities across the country." "Colorado satellite companies WildBlue Communications and EchoStar XI have won nearly $34 million in federal stimulus money to supply satellite Internet access to rural areas....The RUS awards...added a competitive wrinkle for the satellite providers. The RUS awarded $58.7 million to Germantown Md.-based Hughes Network Systems for discounted satellite broadband it can offer unserved rural customers nationwide.That creates the possibility of WildBlue and EchoStar XI facing competition from Hughes for customers wanting services discounted with stimulus funding." If you have ever used satellite Internet, which is NOT broadband, you will know it is a frustrating technology at best, and no substitute for a wire/cable/fiber connection to the Internet. So handing out close to $100 million to companies that are not wiring rural communities seems like an inappropriate use of funds. Reminds us of when the mobile home manufacturers persuaded the Bureau of Indian Affairs to hand out down payments for mobile homes. "The Ralls County Electric Cooperative has nearly completed laying fiber Internet lines along its existing electric cables. In May, it will launch the sales of super-high-speed Internet with 10-megabyte-per-second download speeds. Of course, the electric cooperatives are themselves a consequence of the community spirit which informed American politics in the 1930s (c.f. the Electric Cooperative Corporation Act of 1937). Makes for a great "compare and contrast" study. The last time America's economy and people were in deep distress (The Great Depression of the 1930s) the reaction was to let the banks fail and help the people help themselves. Reaction to The Great Recession and Crash that capped the Bush years? Bail out the banks and let the people fend for themselves. Require telecomm companies to serve all Americans equally as we did in the 1930s? Heck no, that's Socialism! Initiative paves the way for computer literacy in Toledo: "the telephone company also is hoping that many of the participants will become paying customers once the two-year free access period ends. But Richardson said increased Internet access is a boon to the community even if people contract with other companies." "A new report about broadband access in rural America says communities without it will be economically crippled, losing out on opportunities to those with high-speed connections. Dr. Sharon Strover of the University of Texas, who compiled the new report, says that with a slow connection even basic daily functions can put a small business at a big disadvantage." Sorry, but no broadband for you or your children and schools. Please keep growing our daily bread. When I blogged about the truly inspiring Institute for Local Self-Reliance a few days ago and its Community Broadband Map, I suggested that big telcos were trying to put a stop to people creating their own networks in the places that the big telcos refuse to serve. Time Warner Cable’s custom-written bill banning community-owned broadband networks in North Carolina this afternoon received a favorable vote in the Public Utilities Committee... Read the full report here. 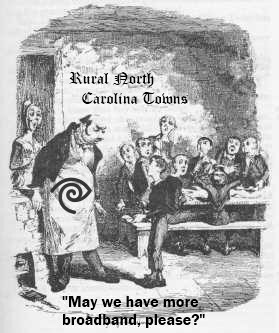 So all of you out there enjoying Time Warner Cable Internet and Verizon FiOS just remember, your broadband provider is actively seeking to stop rural communities from helping themselves while simultaneously denying those communities the kind of broadband you enjoy. And think of my neighbors, paying 5X what you pay for broadband and getting 1/20 of the service you get. Now think about this: If those companies can get away with treating those communities so badly, how long will it take them to start behaving equally badly toward you? The Institute for Local Self-Reliance: An idea whose time has come? Anyone who has spent time trying to get companies to bring broadband to their rural community will know that it can be a lot like banging your head against a wall. The telcos are not interested. Legislators are either powerless or in the pocket of the telcos. And we are now hearing rumors that a lot of the rural broadband stimulus money went to "mapping studies" and "feasability projects" carried out by organizations fronting for telcos. Expect a series of reports in the next few years that declare "broadband access solved for most rural Americans" even as the decline of rural narrowband ghettos proceeds apace. 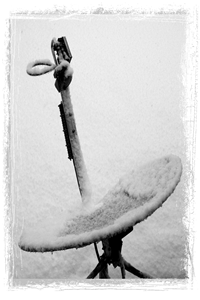 Yes, it's grim out there if you have no broadband in your community and for many people the answer is clearly not going to be the telcos or the stimulus program or even the recently announced wireless initiative. The answer may well lie in our own hands: local initiatives. One organization that is helping folks head down that road is the Institute for Local Self-Reliance. They have a project called Community Broadband Networks. This project offers a lot of hope, some of it in the form of an impressive map of local broadband operations around the country. This is the first map to comprehensively show the broadband networks that are structurally designed to meet community needs first. Most of the networks are owned by local governments, but nonprofit networks will also be incorporated over time. Take a look. It is encouraging. I looked at one pin on the map as an example, a small town in Pennsylvania called Kurtztown that installed Fiber to the Home (FTTH) in 2002. This is a good example because it shows what happens when you go down this road: The telcos try to stop you! That tells you these projects must be doing something right...and fiber to the home, in a small town? What better lifestyle could there be? "Can't come soon enough for the narrowband wastelands and rural notspots." The case for rural broadband used to be about the enormous benefits it can bring to rural communities. Now it is as much about halting the decline of those communities. The country as a whole is driven increasingly by broadband. Today, when a community lacks access to broadband it is outside mainstream America. Not only that, lack of broadband is pushing communities toward a downward spiral in property values from which it will be increasingly difficult for them to recover. Genius idea: steeple-net wireless from church to church. Like silo-net in US. Wonder if any rural villages in US are trying this. In 2011 this could be the way to go for many small towns in America. Sounds like they put a DSL enabling switch in the village (getting a fiber feed from British Telecomm) and then were able to serve the local community with DSL. BBC News - Rutland village installs own high speed broadband. Bear in mind that English villages tend to be more densely packed than rural towns in America, but still worth investigating since the phone wiring is already in place.